The MSI installer for BiBatchConverter designed for large scale deployment in Active Directory environments. 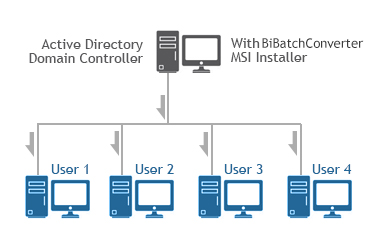 With the BiBatchConverter MSI installer System Administrators can create custom configurations for every User on the system and register or activate the BiBatchConverter. The MSI installer will greatly simplify mess deployment and eliminates the need for customers to build custom installations. Install the Printer driver for evaluation. Keep the user current Default Printer (default). Set Printer Driver to be the Default Printer for current user only. Pre-configure the printer driver using the configuration ini file. Email configuration of email provider, SMTP setting, User name, Password, Recipients, Subject, Email Body and Silent Email sending. SharePoint Upload configuration of login information, upload directory, HTTPS connection and silent uploading. FTP upload configuration of login information, SSL configuration, destination directory, proxy settings and more. Every feature of the printer driver can be pre-configured. Use Profile file to Configuration the printer. Hide Printer driver Printing Preferences Tab(s) from Users. Hide the Upload and Email Options from Users on the Printer driver Printing Preferences.